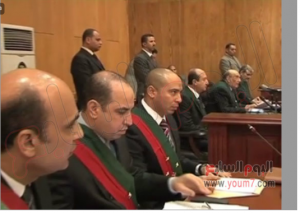 4/11/2013, Trial held at The Police Academy in 5th settlement Cairo. The First Trial Cession of Ousted President Morsi charged with inciting, Premeditated and deliberate killing and torture of demonstrators in front of Etihadeya presidential palace, which took place on 5/12/2012. Charges relate to the death of about a dozen (11) demonstrators and more than 800 got brutally tortured and seriously injured and also resulted with permanent disability for many, in violent clashes outside the presidential palace after ousted President enraged protesters with a decree expanding his powers above the law. Asaad Mohamed Ahmed Alsheikha, 48 years old, deputy of the Chief of President Staff (arrested). Ahmed Mohamed Mohamed Abd Elaty, 43 years old, the director of The President Office (arrested). Ayman Abd Elraouf Aly Ahmed Hodhod, 44 years old, Counselor of the personal secretariat office of the President (arrested). Alaa Hamza Aly Sayed, 42 years old, Inspector of Civil Administration in Sharqeya City (arrested). Reda Mohamed Alsawy Mohamed, Petroleum Engineer (not arrested yet). Lamloum Makawy Gomaa Afify, Commerce Bachelor Graduate (not arrested yet). Abd Elhakim Ismail Abd Elrahman Mohamed, teacher (not arrested yet). 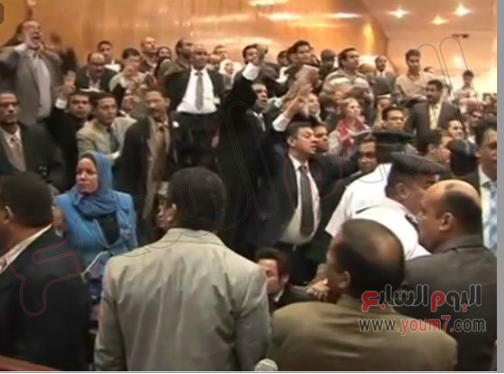 Hany Sayed Tawfeek, labor (not arrested yet). Ahmed Mostafa AlMogheer, 33 years old, Brotherhood member and Freedom and Justice Party member (not arrested yet). Abd Elrahman Ezz, 25 years old, Brotherhood member (not arrested yet). Gamal Saber Mostafa, 43 years old, Lawyer (arrested). Mohamed Albetagy, 53 years old, Doctor, Brotherhood leader in the Muslim Brotherhood Organization and member in Freedom and Justice Brotherhood Political Party (arrested). Issam Aleryan, 61 years old, doctor and Brotherhood leader in the Muslim Brotherhood Organization and Freedom and Justice Brotherhood Political Party (arrested). Wagdy Ghoneim, 63 years old, (not arrested yet). The court gave authorization permits to all Lawyers of the Defendants to attend the trial and these lawyers attended the trial. Other lawyers who reached the court trial later, claimed they were authorized by defendants but did not get prior authorization permits from the court, they tried to enter the court, but security forces did not allow them, because it is against the law. According to the law, All lawyers who attend court trial must have prior court permits first. According to the prisons laws in Egypt, which has nothing to do with the Judges or courts Laws, that any defendant under Locked up, must wear white uniform; When they are under trial, they wear prison blue uniform; and if they get condemned to death, they wear red prison uniform. This is the Egyptian Prisons Law and rules. It was announced earlier, that Morsi ousted President, refused to have any lawyers defending him, and he insisted to defend himself. He also refused to wear the prison uniform. All 15 defendants including ousted President, attended the court on time, but Ousted President and his deputy of Presidential staff, Asaad Mohamed Ahmed Alsheikha, refused to wear the prison white uniform, because as they claimed they are still in power!. Lawyers and political experts analysed this act of Morsi, that he wants to make a propaganda show out of that insisting of not to respecting laws and prison rules and also to delay the trial and create chaos inside and outside the court, beside that Morsi and the brotherhood since they reached power, were always in this disconnection and total denial of reality! 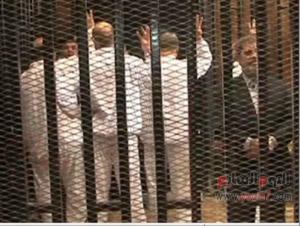 It was also announced through the Medias, that Morsi and the other defendants, attended the trial behind bars at 10:30 A.M. 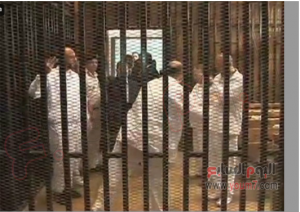 The judge announced at 11:00 O’clock Morning, the adjournment of the trial cession, till Mohamed Morsi the defendant, wear the Prison white uniform. Then the trial was adjourned 3 more times due to the Chaos and insults addressed to the court by the defendants and their lawyers. At 11:48, Brotherhood supporters outside the court, attacked some News Medias Agencies team and cameramen. Brotherhood supporters also damaged Cameras and Medias Agencies cars, and attacked and beaten Cameramen. Brotherhood only allowed and welcomed Al-Jazeera Qatar News Agency, to get their Camera On, while they attacked and beat other News medias Cameramen and forbidden them from broadcasting from outside the court. Video Brotherhood supporters attacked and beaten reporters and cameramen and forbid them from broadcasting outside the court and destroyed their vans. Video Brotherhood supporters throwing stones at Medias cars, and attacked foreign reporters. At 12:10 noon, Brotherhood supporters were gathering in front of the Superior Court in down Town Cairo, and clashes started by Brotherhood supporters against Passers-By, and also against Anti-Brotherhood and Morsi. In addition, other clashes took place in different areas between Brotherhood supporters and Anti Brotherhood, but nothing serious happened, as the little demonstrations and utter failure of Brotherhood in mobilizing their supporters, did not allow them to create the big chaos, they promised the Egyptians of creating one on Morsi’s trial. 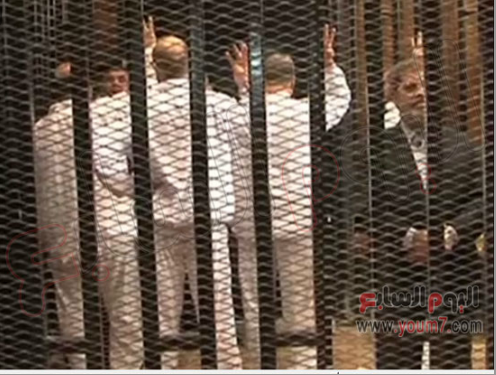 At 12:12 Noon Mohamed Morsi ousted President, told the court that he will wear the white uniform, conditioned that his trial not to be broadcast. 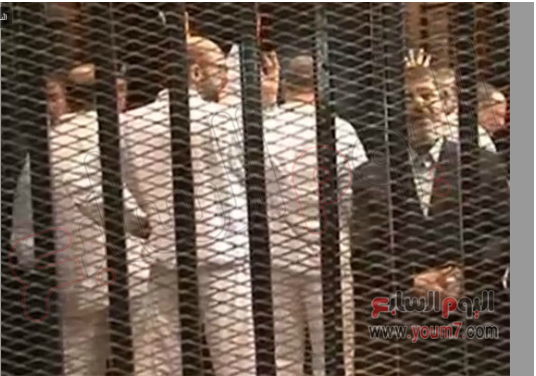 The minute Morsi announced that statement of his, it was obvious that, even that he always live that status of denial and disconnection from reality, but asking for the trial not to be broadcasting, means that he realizes that he is convicted and charged of serious crimes and he is actually behind bars. 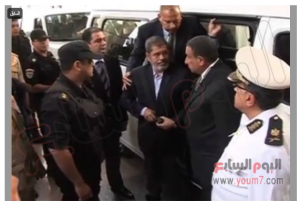 Morsi and other defendants confirmed to the court, that they do not admit this trial and they consider the court and the judges are all related to the coup, and they consider the trial a comic trial. Morsi also told the court that he is The legitimate president of the country and he repeatedly mentioned this 10 times. At 12:20 Mohamed Morsi yelled at the court and judges and repeated very bad insults and a hostile speech to the court and to the Egyptian Military and to Egyptians who participated in the 30th of June 2013, and said that those who participated in the 30th of June 2013 revolution and the Egyptian Military are traitors!!! He also said that he is the legitimate president of the country and he was raising the square Rabaa’s 4 fingers symbol with other defendants. 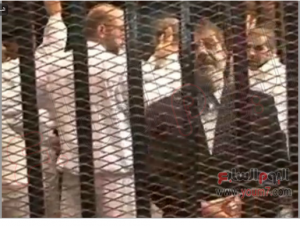 The Lawyers of the defendants also yelled at the judges and addressed Hostile words against the court and the trial and chanted in favor of Brotherhood Organization and Mohamed Morsi. The only Cameras inside the court trial, were The ministry of Interior Cameras. The reporter added that he has never attended a court trial like this one, where he has seen the court and the judges sparkly insulted by the defendants and their lawyers. But the Judges were so patient and great. Moreover, the reporter said that Morsi and the other defendants described the Egyptians who participated in the 30th of June revolution and the Egyptian Military by ‘Traitors”. Morsi also talked about his achievements!!! and repeated that he is the legitimate president. He also interrupted the judge many times, and his supporters who were in the court tried to attack reporters and journalists who were in the court, and the judge was obliged to adjourn the case trial 3 times. The court confirmed the attendance of all defendants and the public Prosecution urged the concerned authorities to arrest the 7 defendants who are still free. When the judge called the defendant Mohamed Morsi Al-Ayat, Morsi said:” My name is Doctor Mohamed Morsi and I’m the legitimate president of the country”!. The court delayed the trial to 8/1/2014 for acquaintance, after the judge received all the defendants lawyers requests and inquiries. Mohamed Morsi will be trialed for other Ten serious Treason charges and crimes committed during his reign, in addition to the 5/12/2012, Etihadeya presidential place crime trial which First trial was held today. The Ten charges and accusations, will be held separately through different trial cases, the dates of trials will be announced Successively. I was following what the International news medias were publishing about the trial, and realized that the majority of their reports, haven’t mentioned anything about the crime committed on 5/12/2012, which is the subject of the trial, 11 demonstrators got killed, and more than 800 got brutally tortured and seriously injured and also resulted with permanent disability for many as if those who got killed and brutally tortured by MB thugs, were just trivial insects, and not Human Beings. 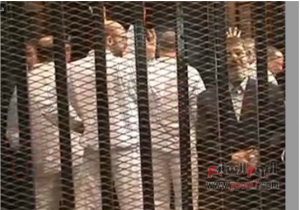 Instead, International News Medias, mentioned in their reports false information about Morsi and MB’s Lawyers were not allowed to enter the court. They totally ignored the fact, that those lawyers, they talked about, arrived to the court later than the trial hour, and wanted to get in, without agencies from the defendants or permits to enter the court trial…! Fake news as usual! Video, Morsi talking to a reporter from Al-Watan news, prior to his trial. He was mumbling, talking about different issues, which gave no meaning to what he wanted to say, he sounded like disconnecting from reality, the same way when he was in power, in status of total denial of reality. He said Egypt and Israel and the conflict which exist between the two countries. Then he said, what is happening is comic. Then he added, All Egyptians do not approve what’s happening, I’m the one who is paying the price…Then he said I do not exclude the fact that, maybe Israel is behind the Coup. Because Israel is always behind all Disasters which happen in Egypt. I don’t have any proof on that statement, but I’m positive that Israel is behind what is happening in Egypt.When Egypt is going to be independent in all aspects, Israel then won’t have any value!!! Video, Brotherhood blocking the Ring Road, Cairo.